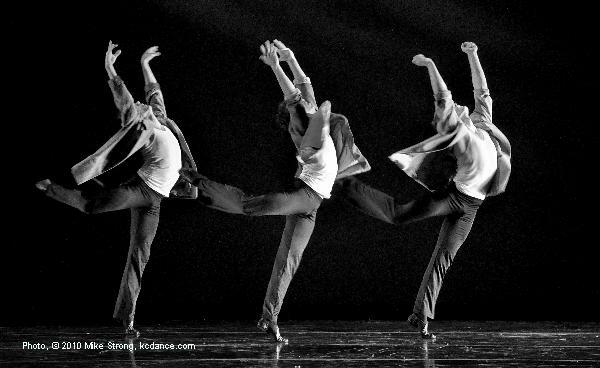 concert in which Shapiro picks the songs, provides live narrative and W/H provides dancers and new choreography. 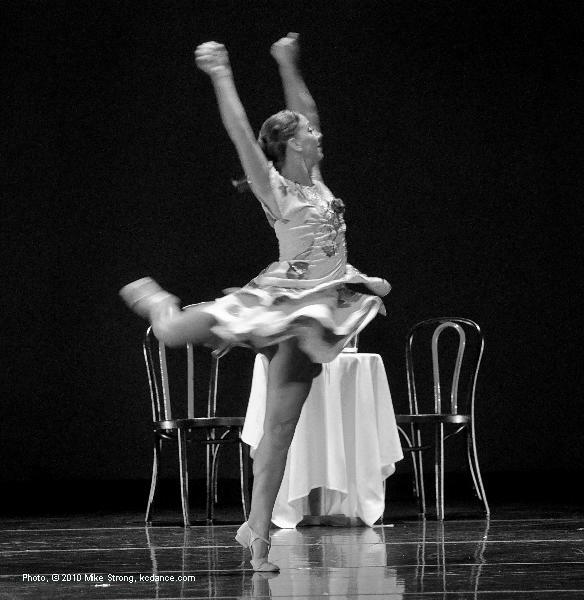 Music picked by Bill Shapiro with all new choreography specifically created for this playlist. Tickets were $24 for adults, $18 for students, and $15 for seniors. I've long wanted to see more exposition in dance concert, both in spoken narrative and in the programs. Friday and Saturday we got that with lawyer and radio DJ Bill Shapiro giving us song history just as he does on his long running (33 years) weeklly radio program with KCUR, Cyprus Avenue. Not unlike variety shows of old, and a form of story telling, Bill Shapiro's narrative small histories pulled the program together in a continuous flow. Instead of bows at the end of each piece, followed by house lights up and a long pause before house lights go down again and the curtain is pulled, Shapiro was the mortar for the assemblage. I've often wished for more explanation to provide context and a fuller understanding of a number. There is an old rule for the cutlines under pictures in newspapers that you use the cutline to flesh out picture details which cannot be gotten from the picture itself. I do wish dance and other arts would follow that simple rule. I remember an Ailey performance in 1997 or 98 or ?? when the second intermission was left off the program. People left the downtown (KCMO) theater thinking the show was over. 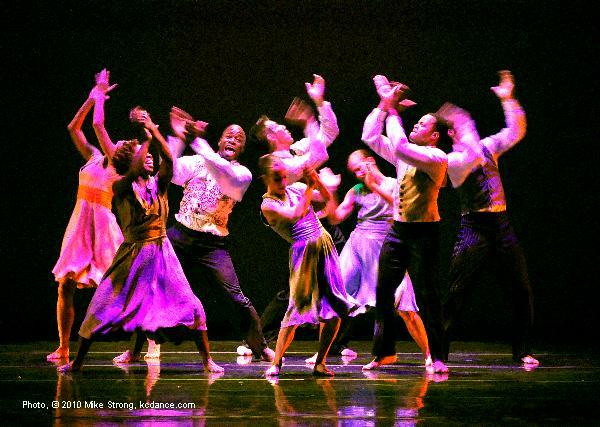 The individual pieces in that old Ailey concert ran one into another and were just abstract enough that many people thought they were at program's end, even though the ending number was the gospel classic "Revelation." I was one of the people who ran down the street after patrons telling them there was more. But that convinced me companies cannot merely assume that part of art consumption is "getting" the "un-gettable." The exhibitors really challenged me about the propriety of including a cutline. Just not done. In a separate guide book maybe, not on the picture. But I believe explanations and clear marking lines are important and belong together, as a package, so they don't get lost. Context not visible in the picture needs words to really frame it. It seems odd to me that we take our pictures from within a context and then show the picture in isolation either expecting the viewer to psychically divine the context or pretending that the image is now on its own as a new reality. Sometimes true. Something similar happened some years ago with "Guernica" - Picasso's famous picture of the massacre of the town of Guernica, Spain by the Nazis in the Spanish Civil War. Someone in a hotel chain thought the picture was a peaceful pastoral scene. She was widely pilloried and made fun of and I think may have lost her job. The hostility toward her astonished me. But I am a software engineer (programmer) and I do user interfaces. I can tell you there is no such thing as "obvious-to-all" people. I can conceive of someone never having encountered this painting who might think the bull is a cow, and there is a horse and a sun with a light bulb as well as a severed arm (or is it merely dis-embodied). I've read all too many "explanations" of the painting and I consider almost all of them badly overworked. Picasso himself kept it simple, a bull is a bull, a horse is a horse, he said when asked. Ask yourself what you do when you put together a montage. Usually when we first run into"Guernica" we are guided there by words. Because we have a verbal context we assume the visual context is now obvious. Words clarify, direct and expand our visual horizons. That way this particular flower picture becomes something more than just one more flower picture. This particular picture now includes a story about conscience, honor and tragedy in wartime Germany and a future doctor (Trautee Lafrenz) who emigrates to the US and headed a Chicago school for emotionally disturbed children and children with mental impairments for 22 years (1972-94, Esperanza School [esperanza is Spanish for "hope"]) who now lives in South Carolina. Now you've provided dimension to an otherwise undernourished plant (no pun needed) and just in case there is someone who really didn't know this is a flower you've covered that ground without being obvious. Actually flowers probably don't need this assurance but other seemingly obvious subjects do. So I was interested in seeing how this process worked in practice for a dance concert with Bill Shapiro as narrator. An additional interest point for me is that this audience had a lot of radio listeners of Shapiro who were not the regular dance crowd I see again and again. I heard a number of people, saying how much they admired the dancing. One asked, "Who are these dancers?" I'm tempted to quip that Shapiro tap danced (couldn't help myself, pardon) between numbers but he was doing far more than stalling for time. As Shapiro spoke I saw at least a couple of things taking place. First, of course, is that the narration frames the entire show, forming its structure. Then, the narration is a very practical method to fill time for the turn around on stage and costume changes which otherwise become blank interludes during which audience attention wanders. The narration provided context for the works just completed and upcoming and seemed to build audience appreciation and anticipation. The narration became a bridge device to smooth out transitions between pieces and maintain attention. Shapiro's musical picks covered the rock-n-roll era while including non-rock categories of music within that time frame. So in addition to rock we heard country, gospel, folk and Leonard Cohen (insert your own category here). 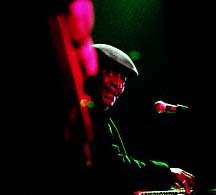 The show began with the anti-war / civil rights anthem by Marvin Gaye, "What's Going On" using a social, party atmosphere with seeming light-hearted music as a counterpoint to the title's verbal question and demand-to-know what is going on both with Vietnam and with the social situation in the US. Gaye's brother was in Vietnam at the time and he wanted answers as to why and what he was doing there as well as why a returning veteran would be dishonored in the land he fought for if he was black. Mary Pat Henry did the choreography on this opener and also the closer, Ray Charles' "What'd I Say." You know you are in solid conceptual hands as you view her choreography. She is professor of ballet and associate Dean of Faculty Affairs at UMKC. "Johnny B Goode" is danced as a duet by Christopher Barksdale and Tracy Vogt with the same social/party set for "What's Going On." While these musical picks were being made Mary Pat Henry, the artistic director of Wylliams/Henry did what I think is a smart move, she brought in a range of people to choreograph pieces. 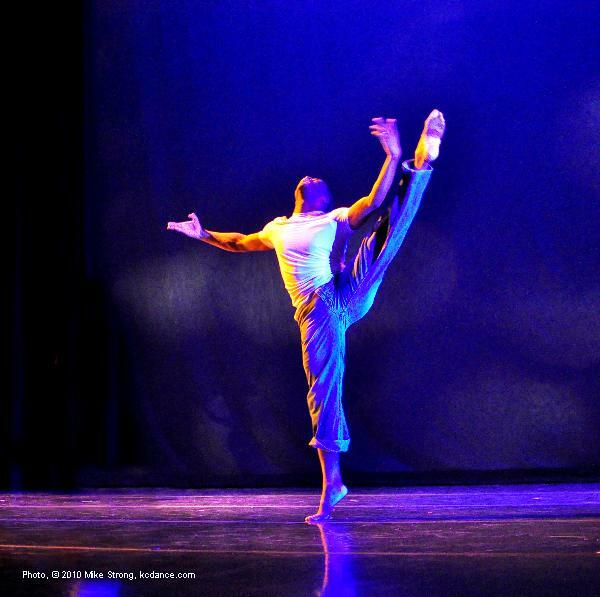 William Whitener from the Kansas City Ballet choreographed DeeAnna Hiett in "Walking After Midnight" by Patsy Cline. It was a renewed collaboration between Whitener and Hiett and an extension of Whitener's suite of Peggy Lee tunes featuring Hiett, "Change of Heart" (Wylliams / Henry Fall 2005 debut). A number of the dancers were also choreographing pieces. Among them Telly Fowler with both the Mahalia Jackson pieces. "Didn't It Rain" was danced as a solo by Latra Wilson, energetic, cute and sassy. Wilson is a graduate of UMKC and is married to fellow graduate Winston Dynamite Brown. (they graduated a year apart - 2004 Winston, 2005 Latra) Both went to Taylor 2 together in 2005 later leaving the company. Winston is now with Pilobolus. Keep Your Hand On The Plow - Left to Right: Christina Mowrey, Tracey Franklin, Telly Fowler (choreographer), DeeAnna Hiett (low center), Tracy Kofford (high center), Tracy Vogt, Christopher Barksdale, Gavin Stewart. "Keep Your Hand On The Plow" was an ensemble piece with rhythmic swaying and sashing. It could also have been a bring-down-the-house piece had it been at the end. As with so much gospel, this one was a knee slapper, litterally. You could hear the entire house get into it with this number. The intensely felt piece by Paula Weber from Bob Dylan's "Simple Twist of Fate" featured DeeAnna Hiett and Gavin Stewart. The sensuous duet records a chance meeting, a day and a night together, a parting and a realization after that this was the one, but gone now. He searches for her in vain. These two have been working together for some time now and you can see the development in movement as they dance their characters from the song. 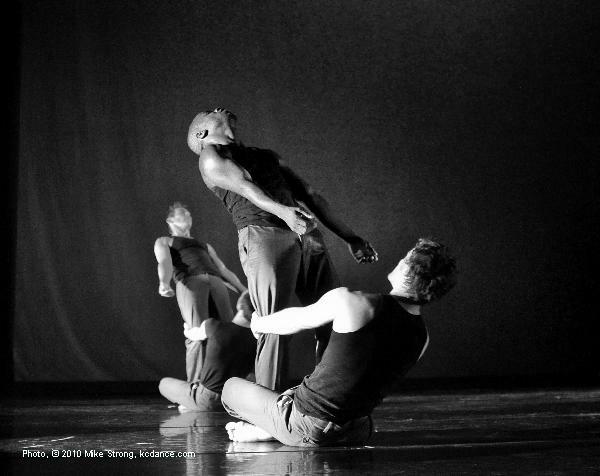 Hiett is a stalwart of Wylliams/Henry as well as UMKC dance faculty. 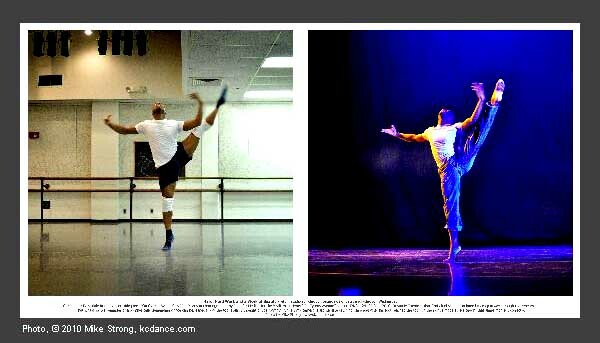 Stewart is still a senior in the UMKC dance program who consistently works hard, getting better with each new work. And he has been doing a lot of work. Right after the sensuous, aching piece by Paula Weber, came Weber's radically different choreography for Dylan's cynical Subterranean Homesick Blues. 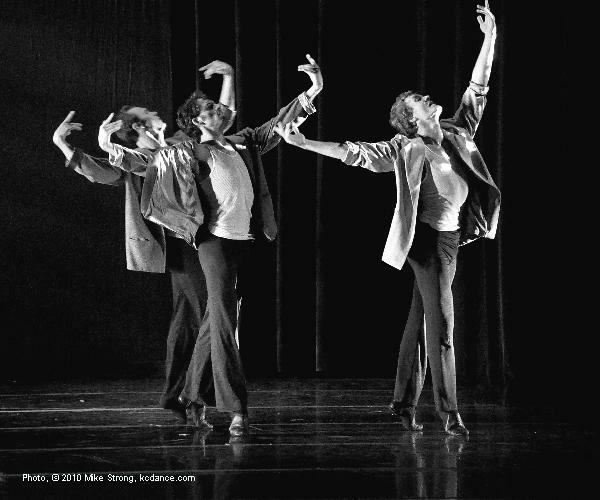 Four male dancers lined up on a stage divided heavily into four upstage-downstage chutes by thick shadows from the back of the stage to the front and down over the apron to the audience front. The dancers moved frenetically back and forth sometimes bursting across the stage apron to lay over the edge, half way to the audience, but always trapped within the lines. The message is that you can get busted for anything and nothing, just because the authorities want to mess with you. 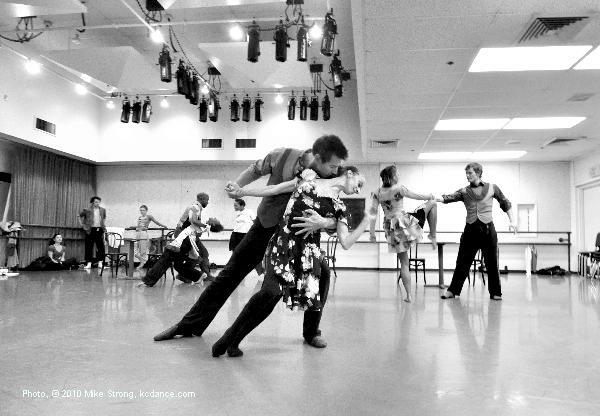 The dance is riveting, holding you within the dancer's own lines. 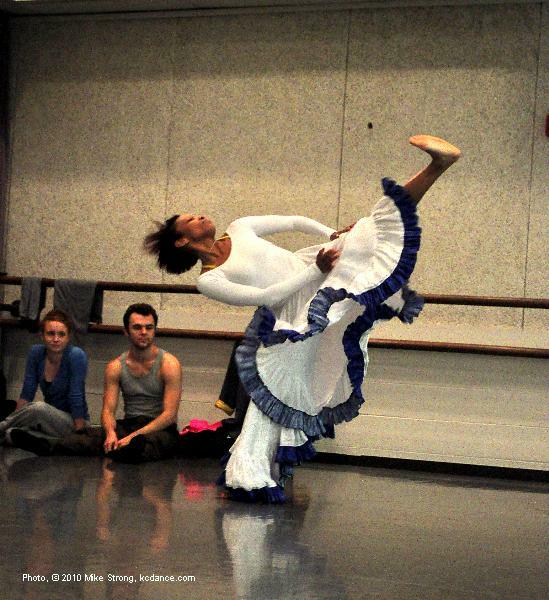 Weber is a member of the W/Henry board as well as chair of the dance division at UMKC. In a sense Dylan's lyric style, jumping from one association to another, jerking between thoughts in the same vein, pre-dates rap patterns, although freer than rap in that Dylan's sing-song works to convey his meanings, perhaps because his style is his own, while rap's sing-song subverts the meaning behind a stylistic screen which often seems more interested in random rhyming than in meaning associations. This is one concert with a real difference. 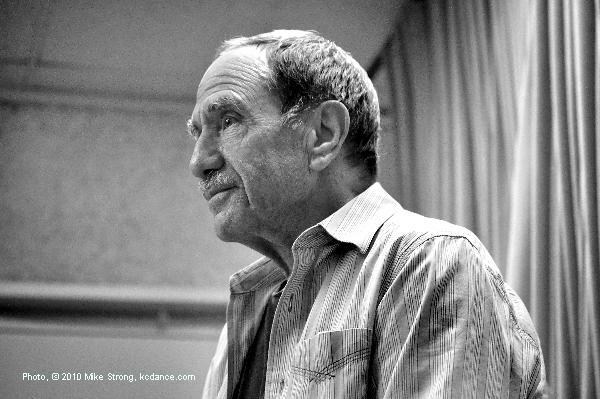 In a first time collaboration Bill Shapiro, whose radio show "Cyprus Avenue" began in 1977 (now 33 years) will host and narrate a dance concerrt with musical artists and songs of his choosing to new choreography by a wide variety of choreographers. In all 18 songs by 15 artists. 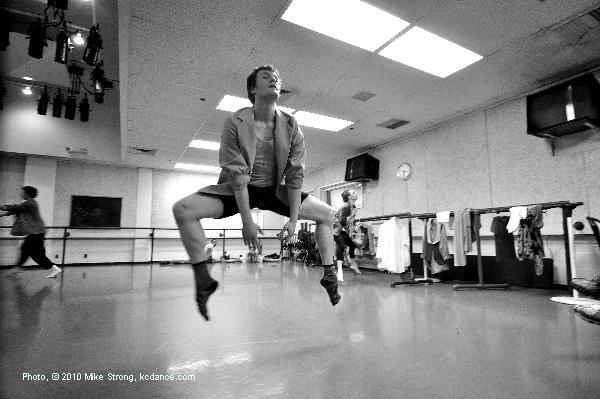 Shapiro will read his narrative of 2 or 3 minutes ahead of and between musical artists featured as the dancers perform. Cyprus Avenue is the name of a street in Belfast, Northern Ireland, the home town of Van Morrison. Morrison wrote the song in 1968. It is about class distinctions and being born on the wrong side of the tracks. It is this song which gives its name to Shapiro's Cyprus Avenue radio program on KCUR (http://www.kcur.org/cyprus.html). Because the work can look so smooth, It is easy to forget that these dancers are performing work which is risky as well as beautiful, very skilled and yet still on the edge. It doesn't take a lot to go wrong and "wrong" happens in any instant. There are so many instants. It wouldn't be correct to call these dancers daredevils but they do tread (with awareness and ability) where others cannot. During the Saturday afternoon rehearsal's run-through, in "Satisfaction" by the Stones, Michael Tomlinson was throwing Brittany Duskin in front of himself and straight up to just above head level. Britanny was laid out in a horizontal position and spinning. But, instead of going straight up on the throw while spinning, she wound up in a backward trajectory, right into Michael's face, bringing down both of them. It hurt and Michael was down for a bit. It could have gone worse. Quickly. Here is another example. During a studio run-through I noticed about half-way through that Christopher Barksdale had put knee braces on both knees. Nothing unusual here. Most dancers have new or old injuries which need tending to while still working. Knee braces and other injury helpers are common in rehearsals and usually removed for performance, especially when visible. As Chris hit an extension during title "Cyprus Avenue" number I caught it in a shot and my first thought was "Joe Namath," the quarterback from the Jets many years ago who was famous for (in any order) his nightclubing, his playing and his injuries. This one also reminded me, at the same time, of a picture I took in 1974 of a college football player at KU with his pads and equipment, alone in a locker room after a game. For all the injuries dancers endure they work right on through them with grace and precision. A few days later when I got the same moment on stage I decided to pair up the two images of Chris. A very minor insight into the costs of grace and beauty. Short note: I was a wee tad late for the shot on the left so Chris' leg is in motion, headed down already. Chris's execution was perfect, mine not so. You should always be aware of this when looking at pictures of dancers. If something looks a little off it is probably the shooter, not the dancer. I made sure I got that moment right later, on stage, as you can see on the right (a larger version of the stage shot is farther down this page). 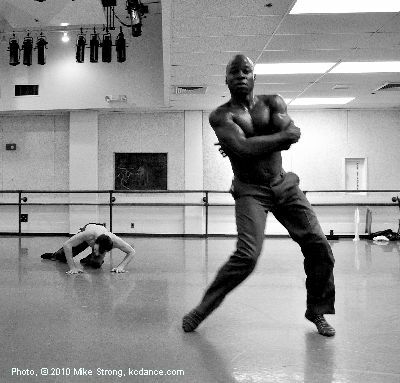 Bill Shapiro (right, on stool) in rehearsal run through with dancer Gavin Stewart in Tower of Song by Leonard Cohen and choreographed by Josh Beamish. Quick photo note. I really like this picture even though my "moment" is a bit late as you can see from Gavin's raised heel. He is starting to move to the next position. 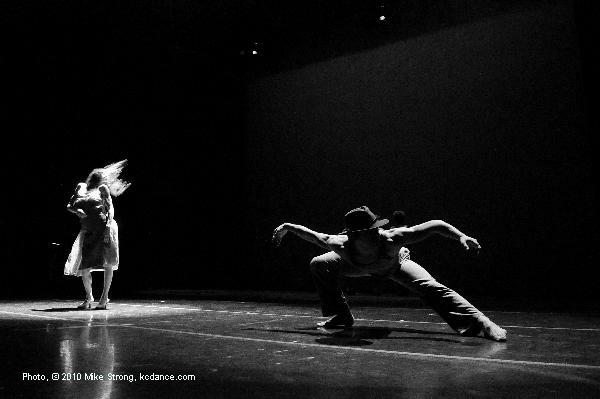 DeeAnna Hiett and Gavin Stewart in Tower of Song by Leonard Cohen and choreographed by Josh Beamish. Same moment as picture above this one only this time I've snapped the shot while Gavin's heel is still down. choreographed by Tracy Kofford and Telly Fowler with thanks to the Dancers. 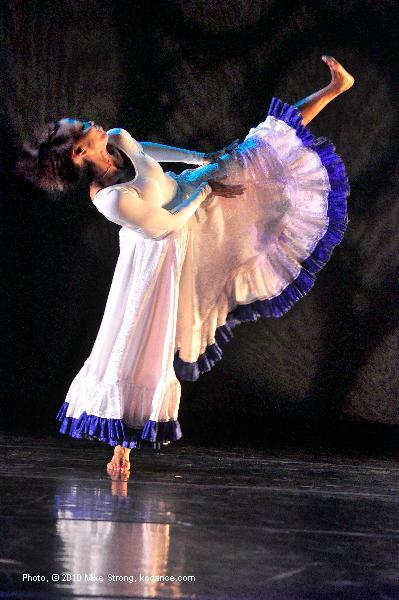 Latra Wilson in Didn't It Rain, a Mahalia Jackson piece choreographed by Telly Fowler. Dancing behind on left: Telly Fowler and Tracy Franklin with Latra Wilson. Dancing behind on right: Christina Mowrey and Michael Tomlinson. In the background in the left corner are dancers Kelanie Murphy, Gavin Stewart, and Brittany Duskin.